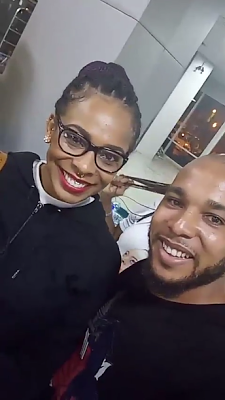 TBoss' brother, Christopher Idowu, has replied to the accusations levelled against him yesterday by some Instagram commenters, claiming he physically abused his girlfriend and forced her to have several abortions after getting pregnant with his child while in Delta state university. Three different commenters posted the same accusations, all of them claiming they knew Christopher in Delta State University and he was guilty of battery and forced abortions. Christopher was silent about the accusations throughout yesterday and has now replied with a picture that highlights the ways to identify a rumour. He wrote; "Now ladies if I have ever beat you before hands up 🙌🙌🙌. Comment here, post a picture with me/you together and tell the world your experience, let's see if by the end of today anyone can do that. Everyone else don't comment, let's see who comes out." Christopher became the recipient of the online accusations after he called out comedian AY for making a tasteless joke about the way Kemen molested his sister TBoss in the Big Brother Nigeria house.